This weekend the 3 of us went to Paris (my christmas present, but the real reason why we went, you will see in a following post): we had a very nice hotel, The Baltimore, between the Tour Eiffel et l'Arc de Triomphe. 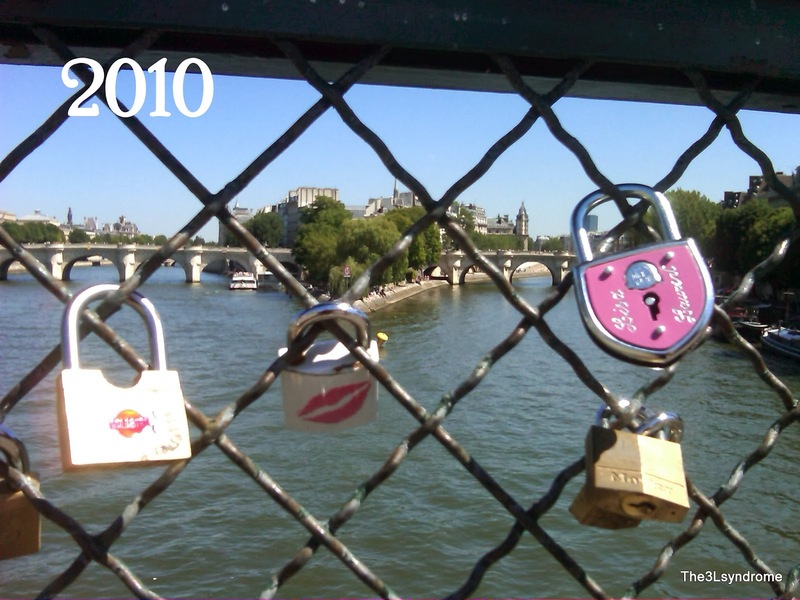 The sun was out, we showed O. the Eiffel tower, we had some nice food and walked for kilometers and kilometers all the way to the Pont des Arts, to find the Love lock we put there in 2010. We wanted to put one attached on ours for Olivia as a symbol for our little family. After a search of 20 minutes, we finally found it, it made me a little emotional. In the evening we walked by the Christmas market on the champs elysées, full of nice lightning and white chalets full of goodies. But sooo many people! In 2010 when we hung our lock on the bridge, there were not a lot of others, but now it's hard to find some space to put one. I have included a picture of 2010 to show the difference.